Find a flat area on the putting green. Arm yourself with 10 golf balls. Then set yourself up, 10 feet from the hole and, putting from the same spot each time, see how many of the 10 you can sink. When you miss, try and ignore the fact that you missed and note which side you missed on. You’ll probably find it’s a consistent side you miss on. That will be a consequence of either your aim (your eyes tricking you) or a technique fault. This is a test worth doing every time you visit the golf course or practice range. You will find yourself with several putts in the 6 to 15 foot range during a round of golf. The players shooting lower scores are the ones who seem to make more of these putts. 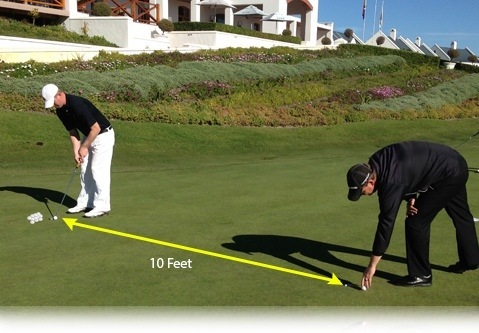 Track your ability and set yourself a target to improve your chances of sinking these putts. This entry was posted in fitness, golf, golf instruction, golf tips, sports and tagged golf, golf instruction, golf tips, open championship, putting tips, swing. Bookmark the permalink.